Last month blubolt helped children’s clothing company Frugi unveil their newly redesigned mobile platform, which aims to offer their customers a more seamless cross-channel experience. Like so many retailers nowadays, the leading children’s brand have been experiencing a sharp increase in traffic to their mobile site. 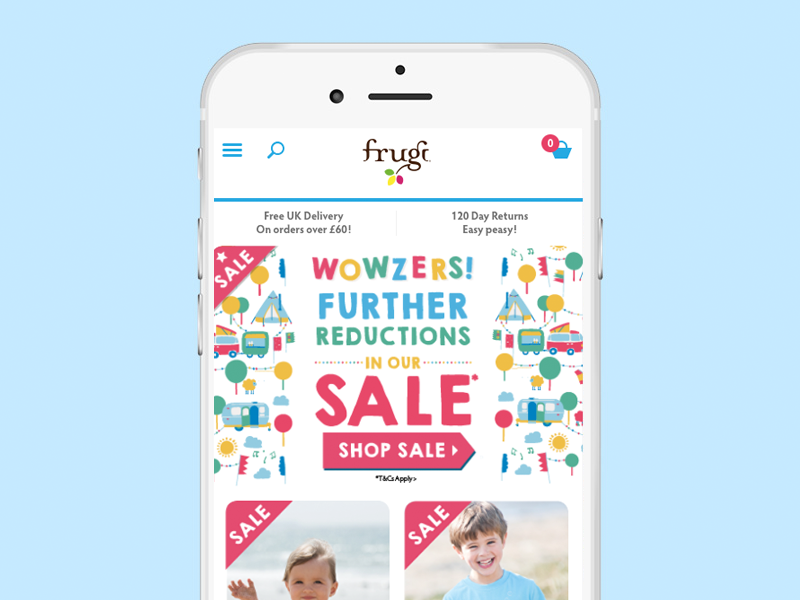 With the popularity of this platform continuing to grow, Frugi felt it was time to update the look and usability of their mobile experience. Alicia Puckey, Project Manager at Frugi, is incredibly pleased with the outcome of blubolt’s redesign. The new design boasts this user friendly format throughout the site. The hamburger style menu means customers can navigate with ease to any area of the site, no matter what page they’re on. This menu is a permanent fixture of the sticky bar, along with search and basket. It’s always visible for added convenience and reduced friction. Also, now that Frugi are on the latest version of blubolt’s mobile platform, they can benefit from the exciting developments our roadmap has in store.